وجه العملة تمثال من تصميم جودي كلارك للملكة اليزابيث الثانية مع نمط جديد من الضفائر في الخلفية وعبارة "اليزابيث الثانية د.ج. غوج ف.د 100 جنيه "
ظهر العملة الكلب سعيد يركض تعبيرا عن الحرية، والطابع الصيني للكلب وعبارة "سنة الكلب 2018 1 أوقية الذهب النقي9.999"
تمثال من تصميم جودي كلارك للملكة اليزابيث الثانية مع نمط جديد من الضفائر في الخلفية وعبارة "اليزابيث الثانية د.ج. غوج ف.د 100 جنيه "
الكلب سعيد يركض تعبيرا عن الحرية، والطابع الصيني للكلب وعبارة "سنة الكلب 2018 1 أوقية الذهب النقي9.999"
1 أوقية 2018 عملة ذهبية لدار الملكية البريطانية السنة القمرية للكلب When you order your lunar year of the dog 2018 1 oz gold bullion coin from our online store, you’ll enjoy the lowest price online. This coin is the newest addition to the Shengxiao coin collection, which features contemporary depictions of the 12 animals in the Chinese Zodiac. The coins in this collection are the perfect way to continue the rich gift-giving heritage of the Chinese people. Not only do they make the ultimate gift for or reminder of a loved one born under the same sign depicted, they’re also a powerful symbolic and prophetic representation of the year they celebrate. The reverse of the 2018 addition to the Chinese lunar collection features the dynamic image of the dog at play. The title “year of the dog 2018” is also visible on the reverse, as is the coin’s purity and weight. The coin’s obverse features the Royal Mint’s most recent definitive portrait of Queen Elizabeth II, as well as her Majesty’s title. Also on the obverse is the coin’s $100 denomination and a field of textured guilloche. This year’s animal design is the fifth contribution of UK based print artist, Wuon-Gean Ho to this exclusive collection. 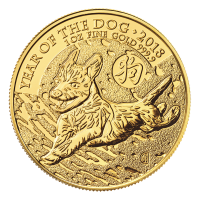 Add the 9999 fine gold luster of a lunar year of the dog 2018 1 oz gold bullion coin to your holdings today, whether to pass on as a gift in future or hold on to, for posterity.